About a week ago, the day after my birthday, I was preparing dinner and thinking, quite selfishly, that not enough had been done to celebrate my natal day. So I walked back to my teeny "cellar" and looked over the selections, seeing if one was ripe for the plucking. I had been worried about a 1989 Bert Simon riesling for a number of months. Wines from Simon from that year were particularly praised. I didn't want it to go south and start to fade, all because I hesitated in breaking it open. A recent call to the store where I bought it, Crush, assured me the wine, a Serrig Wurtzberg Auslese, was probably at its peak, and well worth sacrificing. So in the fridge it went to chill. I wish I had more than one of those Simon '89s. Was a delish treat from top to bottom it was. And believe me, I drank it top to bottom in one evening. It wasn't hard. The alcohol was only 10%. But beyond that, the flavor made it impossible to put down. Honey, ripe orange and tangerine and clementine, orange blossoms, more honey, a little lick of diesel at the end, and a dusty edging of slate. And an afterthought of apple pie. The firm structure and good acidity all served to spotlight those wonderful fruit flavors. There was no flabbiness to the wine. It was in its prime. Fresh. The color alone was a pleasure: a sunny yellow-tangerine hue. I went to Crush the following week in hopes of finding another bottle. No dice. 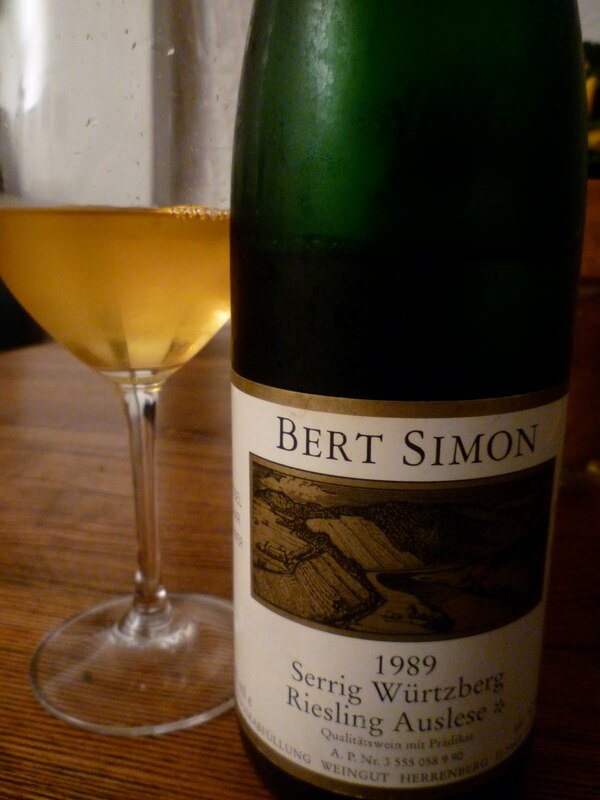 But I did pick up four other rieslings to lay down and take the Simon's place. Future birthdays must be thought of.